Right now he is in crises mode. He is primarily a football fan and specifically a Dallas Cowboy fan. Yesterday they released his favorite player Keyshawn Johnson. The rumor on the street is that Dallas will sign T.O. Caleb sees this as possibly good for Dallas if Owens can get his life together. He told me the other night, “I prayed for T.O. last night; that he would get his life together.” This is his heart. …back to the battle of the breakfast table. The green army was fighting the brown army but I don’t know who the good guys were. And I’m not sure whose side the police force was on. This morning, they were all gone. The battlefield was clear. No bodies, no debris. Then I saw it. 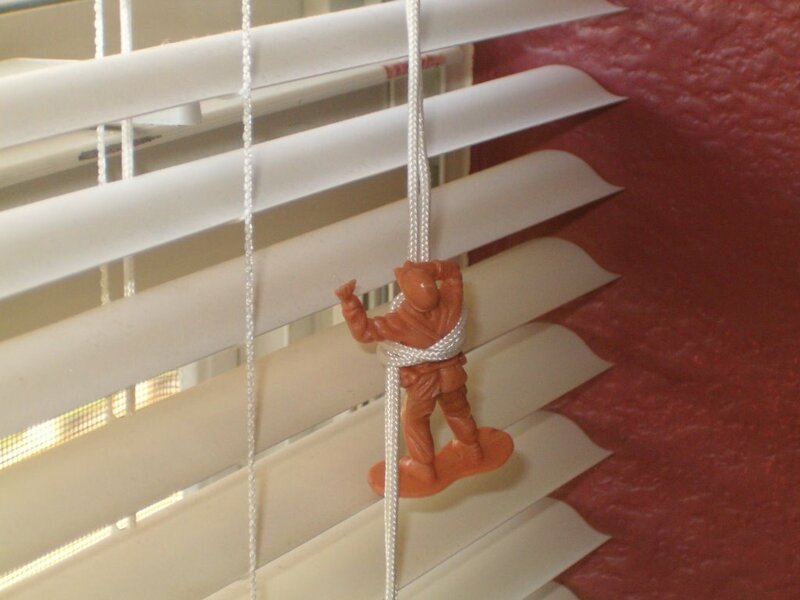 In the string that lifts the mini-blinds on the window next to the battlefield, a single brown soldier hangs as the only reminder of the epic battle that took place here. This toy soldier doesn’t tell us who won the battle. But it does tell us one thing… this is the kingdom of a boy – a “Boydom”. For all who live in a Boydom you know it’s a great thing. These little pieces of evidence, like hanging soldiers in blind chords, remind us of the greatness that lives in the heart of a boy. I’m grateful for having been a boy at one time myself. But more than that, I’m thankful for the boy that rules of our Boydom. He will be a strong man of God someday I’m sure… but for now… He is “The Boy” and I love him. Special thanks to "The Hope". She took the pic and sent it to me at work. man that was great stuff! we live, move and trip over "boydom" all the time. only in our case it's "boyzdom" cuz there are two of 'em. swords, guns, explosions, all the good stuff.